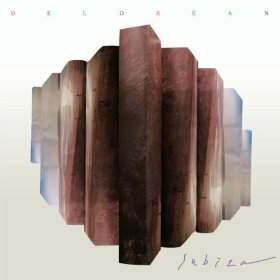 If you’ve ever wanted to imagine what an 80’s abandoned factory synth rave was like you might want to begin by picking up Subiza, the new album from the Basque quartet Delorean because the sound is right on target. The 9 track album abounds with audio layers drenched in echo which seem to ache for a large late night dance floor in some hip European town I’ve never heard of. The songs are reminiscent of the electronic layering of bands like Animal Collective but after a ride in a hot tub time machine because there’s a more distinct 80’s feel due to the uptempo backbeats. The album opens with “Come Wander” which gives a good sense of what is to come with its playful repetitive sounds and wide scoping vocals which contain as much longing as the song does positivity. This is followed up almost seamlessly with “Endless Sunset” and “Grow” which intensify the slight sense of sorrow amid synth ecstasy and sounds like they might be on a mix tape that the creepy villain from Silence of the Lambs might be listening to while he tells his victim that “it rubs the lotion on it’s skin.” The album progresses as the songs continue with tracks like “Real Love” which has a more modern feel and cleaner vocals despite the Marky Mark “Good Vibrations” backbeat. In all the collection is a good listen if you’re a modern synth-ster or if you’re still rocking the Iroc and played out all your favorite tapes.